Discover the world aboard Queen Victoria and experience the renowned Cunard experience. Queen Victoria‘s World voyages depart each year in January and take guests to the enchanting and exciting corners of the globe. For more information about these world voyages have a look at our World Cruises page. If you’re unable to commit to a full world voyage, Queen Victoria does have a number of world voyage segments and destination cruises for those wanting a holiday in Cunard style. Cruise into and out of Australia with Cunard – cruise from the US or cruise to Asia or all the way through to South Africa. Explore the cultural smorgasbord of the Far East, or the vibrant cities of South America. Discover the man-made marvel of the Panama Canal or the natural wilderness of Africa. Of all the areas of the globe, Queen Victoria spends the most amount of her year in Europe. Cruise Norway, the Baltics and Iceland or the western coastline of Europe including British Isles itineraries. Discover the Canary Island paradise or the ancient cities and lively towns of the Mediterranean. 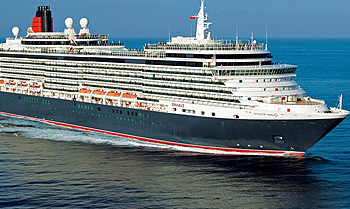 View all Queen Victoria cruises, view a selection of Cunard cruise deals, or view more options for Cunard cruises. Queen Victoria joined the Cunard fleet in December 2007. She is a true Cunarder, proudly upholding our famous heritage and traditions. With luxurious marbles, woods, plush carpets, rich fabrics and soft furnishings, this ship simply exudes elegance. Queen Victoria‘s many diversions and distractions ensure you are as thoroughly entertained and entirely relaxed as you could wish to be. Queen Victoria offers a full array of elegant bars and lounges for guests to enjoy – savour coffee and croissants in Cafe Carinthia or gastro pub lunches in the Golden Lion. Into the evening, toast friends in the Champagne Bar, sip a martini in the Commodore Club or dance the night away to live bands in Hemispheres. Darts, karaoke, live sports and ale – everything you’d expect of an authentic English pub. There’s even a traditional pub lunch served every day, with classic favorites such as fish and chips, curry and Ploughman’s. Cunard’s signature Commodore Club majestically overlooks the bow of Queen Victoria and provides glorious panoramic views as you sail towards the horizon. A signature cocktail menu will tempt you – especially the unique Commodore Club cocktails. You may even be tempted to try our Martini Mixology or Whisky Tasting classes. An elegant pre-dinner drink is certainly on order as you relax amongst the décor of this nautically themed lounge and bar. Through charts and cartography, the elegant menu navigates destination-specific stories, pairing a selection of classic beverages with light canapés and snacks – including delectable Godiva chocolates. Overlooking the Grand Lobby, the Midship’s Lounge is the ideal place to people-watch or enjoy the live music floating up from the decks below. Browse the tempting gin and fizz themed menu, which includes gin served from an old-fashioned spirit tap; to infuse a more distinctive character. The menu brings to life wines, prosecco, cava and champagne alongside premium gin and spirits, which are all blended to create fresh and inspiring cocktails. A vast array of Queen Victoria enrichment and lecture programmes are available to expand your horizons and take you to places you have always dreamed about. Knowledge is yours for the taking through Cunard Insights. Through Cunard Insights explore a number of historical and contemporary issues presented by a wide range of speakers including explorers, academics, former ambassadors and politicians, historians and scientists, novelists, biographers and award winning actors and film makers. The Cunard Book Club offers the opportunity for thought-provoking literary discussions among our guests each voyage. It is led by the Librarian who will provide a short history of the author and lead the discussion. Queens Room is the heart of the ship, where you can enjoy our signature Afternoon Tea, dance all evening and even take fencing lessons. You can settle into a seat in a private box – the first at sea – in the Royal Court Theatre or relax in Winter Garden where the indoor meets the outdoors, especially when the glass roof opens on sunnier days. At night you may want to save time for the Casino or put on your dancing shoes at Yacht Club. Explore a number of historical and contemporary issues presented by a wide range of speakers. From explorers, academics, former ambassadors and politicians, through to historians, scientists, novelists, biographers and award winning actors. Each of our Insights lectures are designed to inform and inspire. Browse the images and films captured by our photographers on your voyage in the photo gallery. Whether a formal portrait session, at QV’s Captain’s Cocktail Party or at the gangway, these pictures and films of you and your fellow guests are all displayed here for you to view and purchase. Cunard passengers have been enjoying the traditional nautical games of shuffleboard and deck quoits for almost as long as we have been sailing. Challenge friends to a game or join in one of the tournaments advertised in the Daily Programme. The continuous deck is ideal for a few laps. To cover a mile on board Queen Victoria you’d need to complete a little over 3 laps. Open from 6.00am, feel free to run on the treadmill, take to the bikes or try the step machines all before a hearty and well earned breakfast. Choose from a range of activities on board QV from relaxing Yoga and Pilates sessions to more energetic ‘Funk Aerobics’ and Spinning classes. Indulge in the truly British tradition. White-gloved waiters serve decadent fresh scones, finger sandwiches and premium Twinings tea in the Queens Room. Self service computers are available for guest use so you’re sure to stay connected during your voyage. Charges apply for internet and email access. Enjoy a first-run feature during your voyage in the spectacular setting of the Royal Court Theatre. You’ll also find a selection of movies throughout the day on our stateroom television. If anything sums up the freedom of your voyage, it is the array of places to eat, from healthy to hearty, from light bites to haute cuisine. Just let your mood decide. Your reserved table in your main restaurant is just one of so many tasty options. The Verandah offers inventive French-inspired dining. Part of the Lido transforms each evening into one of four venues: Lotus offers Asian fusion, hearty Italian fare at La Piazza, Coriander serves Indian cuisine and Smokehouse is the spot for succulent steaks and seafood. Our sophisticated, intimate Princess Grill restaurant serves up unerringly excellent cuisine for breakfast and lunch, whilst dinner is served whenever it suits you between 6.30pm and 9.00pm each evening. To match your dining choice, our sommelier will gladly talk through the impressive wine list. The Britannia Club Restaurant boasts the same timeless elegance as the neighbouring Britannia Restaurant, but with an intimate dining club atmosphere. Dine here for breakfast and lunch, and enjoy dinner in the evening at a time that suits you between 6.30pm and 9.00pm. Your table reservation is at Britannia Restaurant, where grandeur and occasion combine with exceptional service. Breakfast and lunch always feel special here and whether you’ve chosen to take your seat for dinner at 6pm or at 8.30pm, you can arrive with a flourish, down the steps of the curved staircase. Enjoy a casual breakfast, lunch, dinner or late-night buffet in the relaxed self-service Lido restaurant. With cuisine options that take inspiration from around the world, you’ll always find something to tempt you no matter what time you feel peckish. It may be night time that most sets the Queen Victoria experience apart from other ships. For where else will you attend such dazzling affairs as a Black and White Ball, Royal Ascot Ball or Buccaneer Ball all in a setting as stunning as the Queens Room ballroom? Or catch a staged musical production in the Royal Court Theatre. You may want to save time for the Empire Casino or put on your dancing shoes at the Hemisphere Club. As Queen Victoria departs port, her resident band often strikes up by the Lido pool. Enjoy a refreshing cocktail or champagne as that day’s destination slips slowly from view and you begin planning tomorrow’s adventure. Take your seat for a thrilling music and dance extravaganza, comedian or singer in the magnificent Royal Court Theatre. Private boxes offer a great view and come with complimentary champagne and chocolates – the perfect evening. The Royal Court Theatre also plays host to a variety of QV’s high profile guest performers – from comedy acts and variety artistes to opera singers and world-class musicians. How often do you get to waltz in a lavish ballroom? If you’re on board Queen Victoria, the answer is every evening. Dance the evening away under QV’s stunning crystal chandelier, accompanied by a live orchestra. Royal Night themed balls in the magnificent Queens Room ballroom are your chance to don your formal dancing attire and take to the floor in a sea of glittering ball gowns and dinner jackets accompanied by the marvellous orchestra. Do you fancy yourself as an entertainer? In the Golden Lion, the spotlight may be on you, as you interpret a track or two during a lively karaoke event.